While one of the major selling points of tablets is their portability, the typing experience sometimes leaves something to be desired. Most of us are used to typing on touch-screens for our cell phones but doing so on a tablet can be awkward and time-consuming. Those who spend a lot of time typing on their tablets may want to consider a tablet keyboard to make the process go smoother. We have amassed what we believe are the best tablet keyboards of 2018 to make your typing easy and your work go by faster. What does a tablet keyboard do? 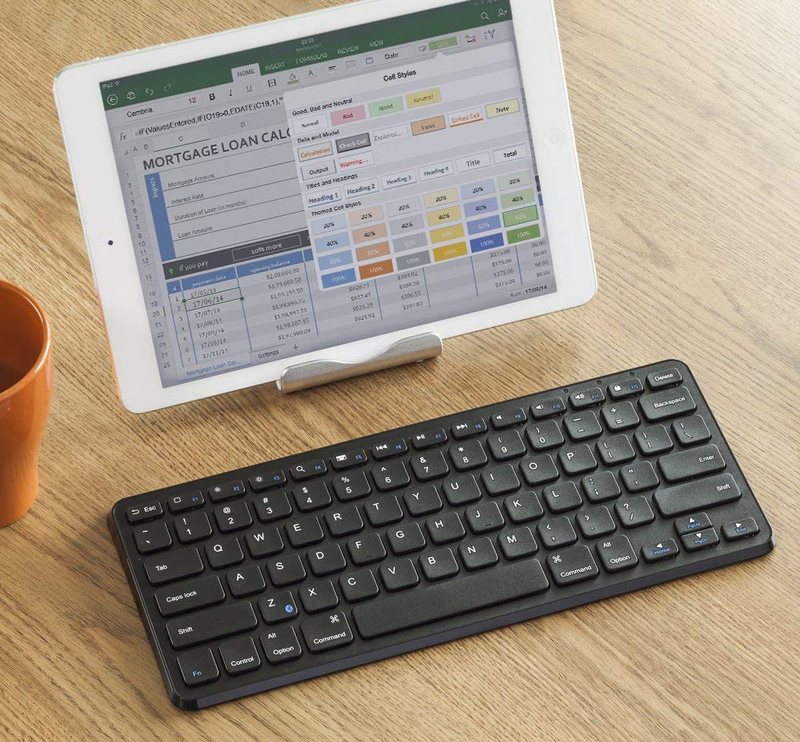 A tablet keyboard will connect to your tablet (usually wirelessly) in order to help you type faster and more accurately. Generally speaking, a tablet keyboard should be paired with a tablet stand or tablet case to hold up the tablet while you’re typing, but some tablet keyboards can hold the tablet on its own. Will a tablet keyboard work with my tablet OS? Most tablet keyboards these days can work with different OS setups, even if they are made by a specific company (i.e., Microsoft keyboards will indeed sync with Apple iPads). However, you will always want to check to make sure that the keyboard will sync with your OS. 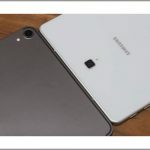 If your tablet has one of the major OS systems (Android, Windows, iOS), then most tablet keyboards on the market will sync with it. If you have a different OS, you will want to do more research. Is it difficult to type on a tablet keyboard? Some tablet keyboards are smaller than traditional keyboards. If you’re a touch-typist, this will probably require some level of adjustment. 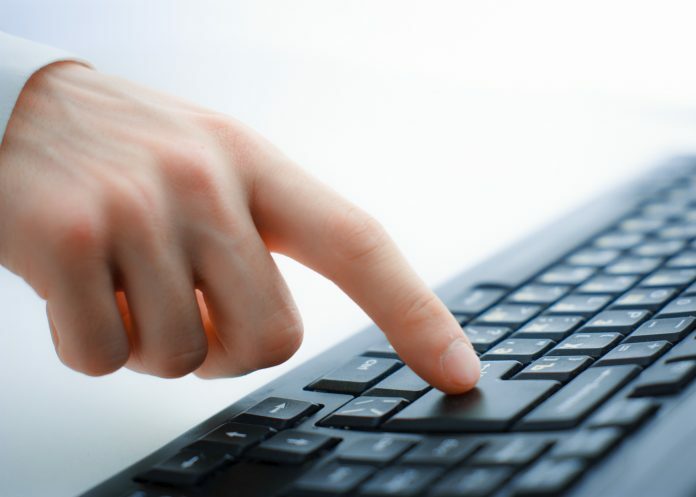 Most skilled typists can adjust to a smaller keyboard with relative ease. If you are concerned about size, there are also some keyboards out there that are full-sized and work well with tablets, though you do compromise a bit of portability if you’re lugging around a full-sized keyboard. 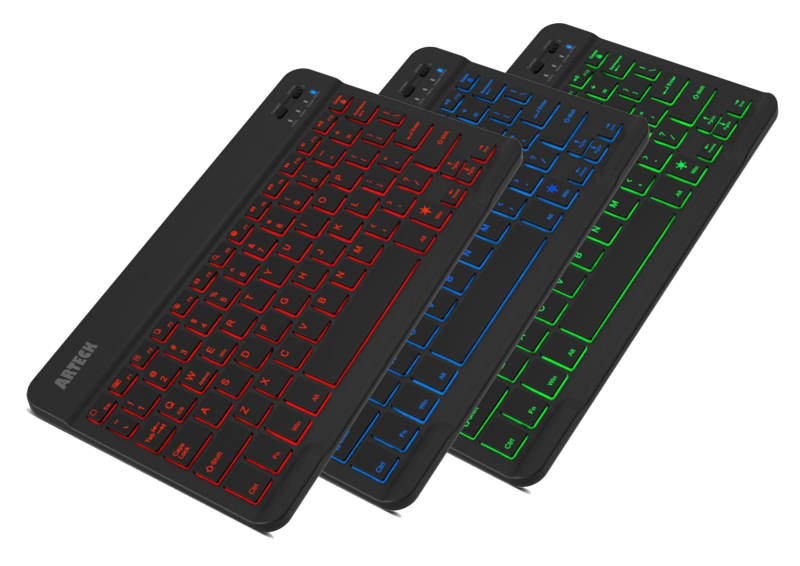 We wanted to choose tablet keyboards that worked with multiple OS systems and also played to a variety of needs. Some people value portability over ease of typing, and others couldn’t imagine ever trying to adjust to a half-sized keyboard. We tried to select the best of all worlds. Plus, we kept an eye on the budget and tried to cater to a variety of price points. Lastly, no matter how much or how little we spent on the tablet keyboard, we always had an eye on quality. A tablet keyboard can range in price from around $15 to over $100, depending on the size of the keyboard, its features, and the brand it comes from. Obviously, the more you pay often means you’ll get more features, but for a tablet keyboard some users may find that less keyboard is better. One of the major complaints that many typists have about the smaller made-for-tablet keyboards is that they often make the typing experience feel very cramped. Smaller tablet keyboards often have smaller keys, and the keys are placed closer together. This can cause experienced touch-typists to miss keys and become frustrated. The Anker Ultra Compact Slim Profile Keyboard is a great solution to this problem. It’s a bit smaller than regular keyboards and a bit larger than normal tablet keyboards, so the Anker keyboard can provide you with a full-sized keyboard typing experience in a smaller package. Broad Compatibility: Use with all four major operating systems (iOS, Android, Mac OS and Windows). Package contents: Anker Ultra Compact Bluetooth Keyboard, 2.3ft Micro USB charging cable, welcome guide, our fan-favorite 18-month warranty. The biggest feature of the Anker Ultra Compact Slim Profile Keyboard is how it fits a full-sized keyboard into a smaller package. If you have a bit of space for a keyboard but still want your tablet to be reasonably portable, then this is a great purchase to make. This is a rechargeable keyboard, and one charge should last you around six months. if you paired this with an appropriate metal tablet holder, you’d have the look of a miniature computer at a very low price. If you’re looking for a keyboard that appears slick but has a very tempting price tag, then this is the one to choose. We can’t recommend this one enough for its performance, appearance and price. This is the keyboard to get if you’re on the fence about whether or not your tablet even needs one in the first place. With the price tag, you can’t afford not to have the OMOTON Ultraslim Bluetooth Keyboard. 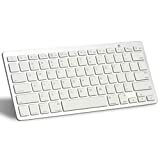 The OMOTON Ultraslim Bluetooth Keyboard has a look very similar to Apple keyboards, with the silver back support and the white keys. In fact, the only real difference at first blush is the size: the OMOTON keyboard is much smaller than the traditional Apple keyboard. 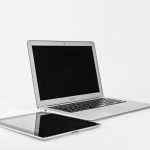 However, even though it appears to be an Apple product, it has connectivity with all the major tablet OS systems, like Android and Windows. Sometimes, all you want is something that is ultra-portable, and this is where the Artek HBO30 Universal Slim Portable Wireless Keyboard shines. This is a great solution for those who want a keyboard that will fit into the smallest of bags, and for those that still wish to type on a keyboard rather than on the surface of their tablet. The Artek wireless keyboard also has an impressive array of backlighting colors, so you can see to type in the dark and have a sleek look, as well. Where the Artek HBO30 Universal Slim Portable Wireless Keyboard excels is in its size. This is a very small keyboard. 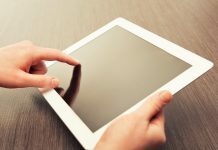 While this might take some getting used to for experienced touch-typists, it means that your tablet will stay like the ultra-portable device that it was meant to be. If you wanted a full-sized keyboard, why not just carry a laptop? 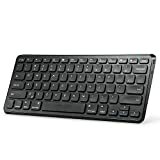 If what you want is a keyboard that is seriously tooled for the needs of the tablet typist, the Logitech K780 Multi-Device Wireless Keyboard is definitely the one to spring for. It’s not the cheapest option, but it’s made specifically for laptops and will provide a phenomenal typing experience. 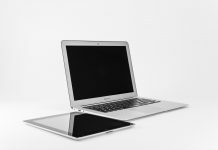 Plus, not only will it connect wirelessly, but it will also connect to a USB port, which is a major plus for those of you who might have older devices or devices with faulty Bluetooth connections. 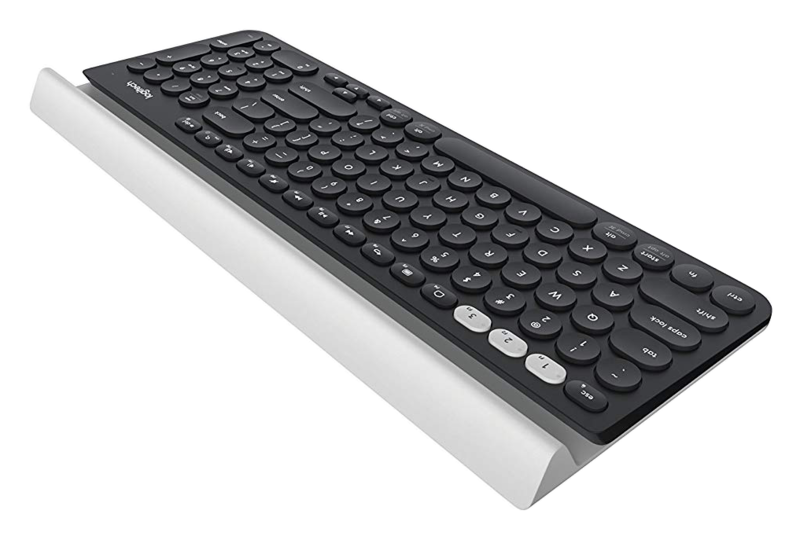 The typing experience on the Logitech K780 Multi-Device Wireless Keyboard is unparalleled for tablet keyboards. Many say that they can’t tell the difference between typing on the Logitech keyboard and typing on a normal keyboard. If you are looking to use your tablet for some serious writing, then the Logitech keyboard is definitely worth consideration. Again, we reviewed a variety of different keyboards because the best tablet keyboard really depends on your tablet computing needs. However, we absolutely fell in love with the OMOTON Ultraslim Bluetooth Keyboard. It’s the least expensive keyboard on the list, but it checked off a number of boxes for us. First of all, it ’s very light, and it’s very portable. It will take a bit of adjustment if you are used to a full-sized keyboard, but we didn’t find the adjustment process to be all that painful. 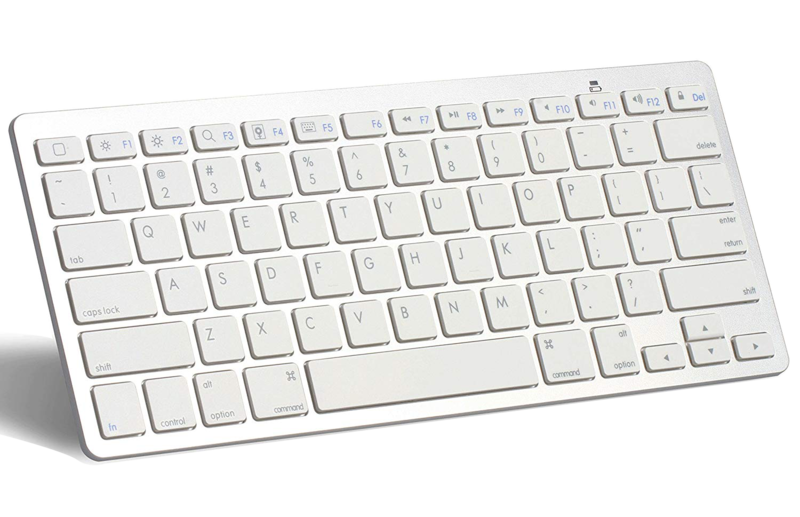 We also really adore the look of the OMOTON Ultraslim Bluetooth Keyboard. Many reviewers used Apple iPads, and when the iPad was combined with the OMOTON Ultraslim Bluetooth Keyboard and a metal stand, it really did look like they were using a miniature iMac. In addition to being adorable, this is also a great corporate look. Not many products under $20 will take you to the boardroom and back, but the OMOTON Ultraslim Bluetooth Keyboard can certainly do it. Of course, the fact that it’s made from plastic means that it doesn’t have the same feel as an Apple proprietary keyboard, but we’re completely sold on its price point. However, if you think that you’ll need a backlight in order to type properly, be aware that the OMOTON Ultraslim Bluetooth Keyboard doesn’t have it. Previous articleAcer Tablet: Which Model Is Best For You And Your Wallet?